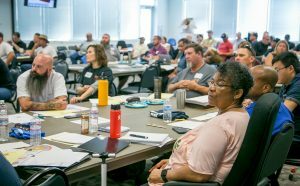 On Tuesday, August 22, IBEW 1245 members from across the public sector packed Weakley Hall to learn about the growing attack on public sector unions and IBEW 1245’s strategy to defend and build our house through Volunteer Organizing Committees (VOC) at each of our public employers. The Labor movement is bracing for a ruling on a U.S. Supreme Court case known as Janus vs. AFSCME, which will likely be decided in June, 2018. If the Court rules against the union, it would eliminate “closed shops” (also known as agency shops) in the public sector. This is essentially the same end result as so-called “Right to Work” (RTW) laws — the objective being to weaken unions and decades-old labor contracts, giving employers unlimited power to define and control wages, benefits, working conditions and regulations. According to Professor Gordon Lafer, a nationally recognized labor expert from the University of Oregon who has documented the impact of RTW in the dozens of states where it is already the law, the detrimental impacts of such a policy are indisputable. To demonstrate what union members stand to lose under Janus and RTW, Local 1245 Business Representative Jennifer Gray held up an original 13-page agreement from nearly 100 years ago, and compared it with the current 120-page SMUD contract. IBEW 1245 Senior Assistant Business Manager Ray Thomas reminded the packed room that absent a labor contract, working men and women at public agencies are exempt from wage and hour provisions of the CA Labor Code. How serious is the threat? Just ask the domestic workers’ unions. In 2014, a Supreme Court decision (Harris v Quinn) stripped away the rights of domestic workers, an assault that was compounded by a well-funded, intensive ground operation to encourage domestic workers to opt out of paying union dues. Describing this moment as one of the most serious challenges confronting labor, IBEW 1245 Business Manager Tom Dalzell affirmed his belief that our members are up to the task. IBEW 1245’s Organizers have teamed up with our Public Sector Business Representatives and developed a fight back game plan for our 2,500 public sector members. IBEW 1245 Organizer Eileen Purcell laid out the twelve-month campaign, which aims to re-sign 100% of our current membership and build leadership and capacity. Business Reps have begun discussing the threat of Janus and Right to Work at unit meetings. Members have attended conferences and trainings. VOCs have already been launched at several of our 31 public sector employers, including Sacramento Regional Transit (SRT), Modesto Irrigation District (MID), the City of Vallejo, and the City of Redding. Connie Bibbs, a 31-year member of IBEW 1245, the Unit Chair at Sacramento Regional Transit (SRT) and a leader of the VOC reported on the progress that her committee has made so far. Modesto Irrigation District (MID) Unit Secretary and VOC member Karri Daves, a 17-year member of IBEW 1245, reported that the MID VOC is comprised of 15 core members. Flanked by six of his co-workers who are on the VOC at the City of Redding, Unit Chair and VOC leader Dave Williams also reported on their outreach efforts and their plans to hold a family BBQ after Labor Day to educate members. Members discussed ways to talk about RTW with members at work, at home and in the neighborhood — by dispelling myths, sharing the facts and recognizing there may be some tough conversations. By the end of the training, members from 17 employers had set dates and made a plan to recruit their co-workers to the VOC. “I’m excited about the level of enthusiasm that our members demonstrated for the fight,” said IBEW 1245 Business Representative Sheila Lawton. “Today, our public sector members took ownership of this fight-back campaign to defend and strengthen their union,” veteran IBEW 1245 Organizer Fred Ross added.